Alas, not a single Myrna Loy film shows up here. But I just can’t resist posting this uplifting photo of Loy serving coffee to American sailors in the Hollywood Canteen during World War II. Lucky guys. There is no subject as well suited for the movies as war. In war there is conflict, love, and of course lots of action. Movies, said Hitchcock, are just like life, but with the boring parts cut out. Thus, movies about war delete the incredible boredom of most war-time experiences in favor of the hyper-drama that characterizes training, combat, and the bursts of romance and friendship that invariably help define characters within a blasted landscape. Seraphic Secret would like to draw your attention to ten spectacular war movies. Each film seethes with a specific national and regional point of view. And yet war and man’s experiences in war are universal, and each film left yours truly horrified, enlightened and deeply moved. Confession: Not a single Myrna Loy film shows up in this list. 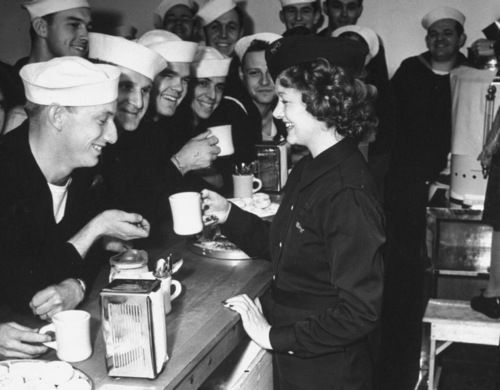 But we just can’t resist posting this photo of Loy serving coffee to American sailors during World War II. Lucky guys. Movies about war are ideally suited to the kinetic energy of motion pictures. The eternal themes of love, courage, and loyalty are given full range in the theater of war. Readers will immediately notice the absence of silent films and movies from Hollywood’s golden age. Yes, in spite of our love of classic cinema we are the first to admit that sound and modern special effects have rendered most older war movies tame and stylized. We have also excluded war movies that treat war as “senseless killing” or set forth a pacifist narrative. As far as Seraphic Secret is concerned, a just war is the only method by which moral states can triumph over evil nations. War is too serious a business to be intellectually castrated by fuzzy minds who traffic in moral equivalence. We concentrate on movies that feature intense warfare, yet whose narrative line does not neglect the more intimate, personal stories. We have eliminated home-front movies, fantasies of good Nazi soldiers ( Auf Wiedersehen, Das Boot), movies about Holocaust victims, tales of spies, and POW movies, sub-genres that—except for good-Nazi movies, historically suspect and morally loathsome—deserve and will receive ten best lists all their own. As always, we invite our readers to list their own ten best war movies. Among the pile of books on my night table, there are always a few volumes about war. It should be obvious to any clear-thinking person that war is the final arbiter of all great conflicts. Those who speak of negotiated peace speak of fiction. The great world wars have made this world what it is, and there are numerous lessons to be learned militarily in terms of the present war with radical Islam. Thus I draw your attention to two very fine books: The Guns of August by Barbara Tuchman and A World at Arms by Gerhard L. Weinberg. The left always betrays the people it claims to represent. Those liberals who report on Operation Protective Edge from Gaza fail to mention that they are severely restricted by Hamas in reporting what actually happens on the ground. If they report the truth Hamas will retaliate against them, often with fatal consequences. For instance, have you ever seen a Hamas terrorist in news footage? Of course not. You only see heart-breaking images of grieving civilians amid the rubble of their homes. Do you ever see a dead Hamas terrorist? No way. Because according to Hamas guidelines every corpse is labeled an innocent civilian. Hamas terrorists, according to the liberal media, are as rare as Bigfoot. Postmodern Liberalism is a pliable tool of propaganda for IslamoNazism.